Guernica is a town in the province of Biscay in Basque Country. During the Spanish Civil War, it was regarded as the northern bastion of the Republican resistance movement and the epicenter of Basque culture, adding to its significance as a target. The Republican forces were made up of assorted factions (Communists, Socialists, Anarchists, to name a few) with wildly differing approaches to government and eventual aims, but a common opposition to the Nationalists. The Nationalists, led by General Francisco Franco, were also factionalized but to a lesser extent. They sought a return to the golden days of Spain, based on law, order, and traditional Catholic family values. At about 16:30 on Monday, 26 April 1937, warplanes of the German Condor Legion, commanded by Colonel Wolfram von Richthofen, bombed Guernica for about two hours. Germany, at this time led by Hitler, had lent material support to the Nationalists and were using the war as an opportunity to test out new weapons and tactics. Later, intense aerial bombardment became a crucial preliminary step in the Blitzkrieg tactic. Guernica, Picasso's most important political painting, has remained relevant as a work of art and as a symbol of protest, and it kept the memory of the Basque town's nightmare alive. 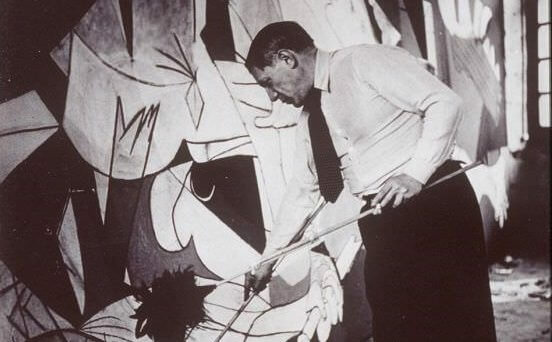 While Picasso was living in Nazi-occupied Paris during World War II, one German officer allegedly asked him, upon seeing a photo of Guernica in his apartment, "Did you do that?" Picasso responded, "No, you did." Guernica is an icon of modern art, the Mona Lisa for our time. As Leonardo da Vinci evoked a Renaissance ideal of serenity and self-control, Guernica should be seen as Picasso's comment on what art can actually contribute towards the self-assertion that liberates every human being and protects the individual against overwhelming forces such as political crime, war, and death.